Highlights include: Dads & Lads Breakfast, Maths Review, Mathathon, sick/unwell kids, school donations, school lunches… and much much more! As part of our technology topic this term the junior school have made boats. The brief: boats must float for 5 minutes. 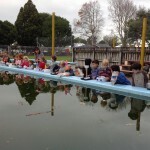 Room 1 tested their boats on Friday and they had a 100% success rate! What a lot of kiwi ingenuity we have in our school! See more photos on our facebook page.